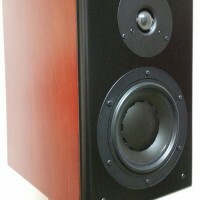 The Baronettes are a simple, no frills, 2-way stand mount speaker with a minimal crossover and outstanding neutrality. 1) I had never used a Morel driver or a Dynavox driver. I had heard good things about both brands and wanted to give them a try. 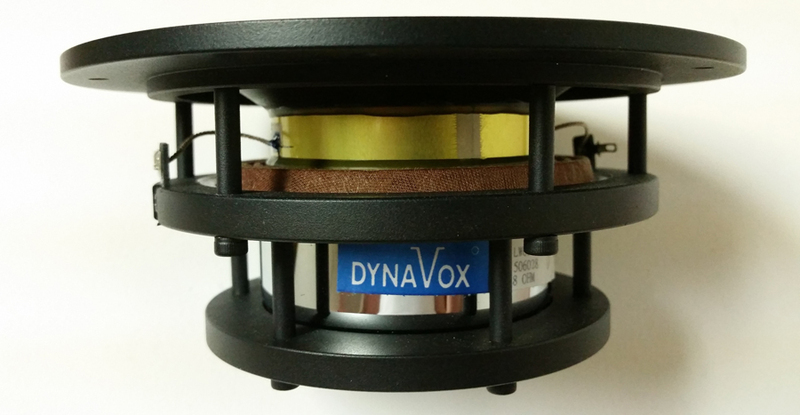 I chose a mid-level Morel tweeter and the mid-sized Dynavox woofer to experiment with. 2) I wanted to make a subtle differentiation in the crossover to focus on the smoothness of the roll-offs of the drivers over the phase integration between the two drivers to see what effect this would have on listening impressions. 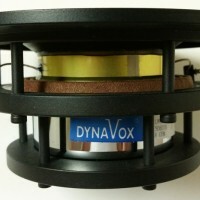 The initial plan, based on the published specs, was to use the Dynavox woofer in a ported enclosure to reach down around the mid 40s. Even the published Qts was a little high for this at .58, but I thought I’d give it a try. 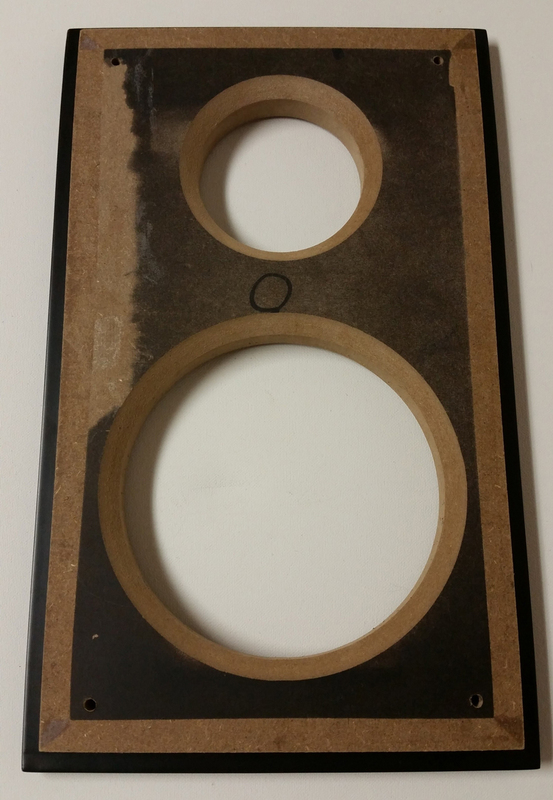 After receiving the woofers and measuring them both at .70, I decided to switch over to a sealed design. 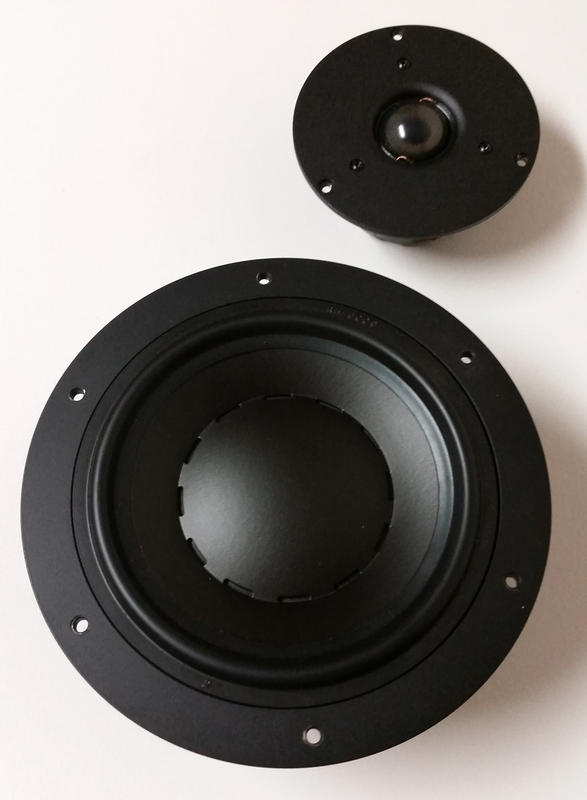 Since I was really looking for midrange fidelity out of the Dynavox driver and not trying to find the next 6″ subwoofer, this was a fine compromise for me. I figured a 1/2 cu ft enclosure would give me a decent sized stand mount speaker with an F3 of about 60Hz and a Qtc of 0.85 to add a little warmth to the bottom end. The dimensions are 14″H x 8.5″W x 12″D, made of 3/4″ material and a 1″ thick baffle. 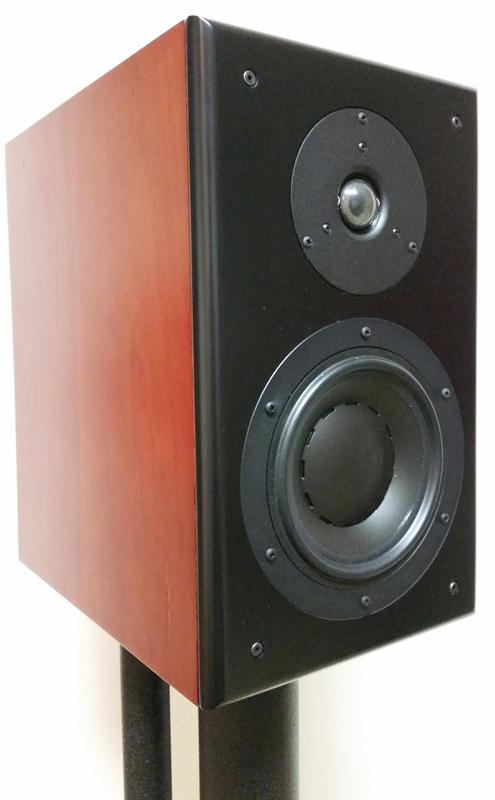 This would be an easy build under any circumstances – it’s a simple sealed rectangular prism with the dimensions above – but it was very easy in my case as I used one of the pre-fab Dayton Audio cabinets as can be seen in the pictures. As such, I have no constuction pics or tips on this project, but again, this is a very simple sealed box. 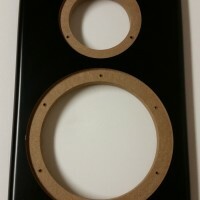 There is a 3/4″ roundover on the front baffle, which is nice, but 1/2″ would do nicely as well. The drivers are flush mounted and the crossover is mounted on the back wall of the enclosure. I lined the walls with open cell “egg crate” foam and loosely filled the cavities with polyfill. 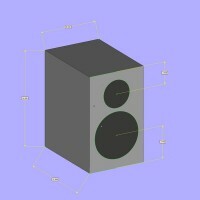 The enclosure dimensions and driver positions are shown in one of the pictures provided. This is where some cool things happened and where, I believe, the magic of this design occurred. As I said earlier, I wanted to focus on making the roll-offs of the drivers as smooth as possible at the crossover point, only checking phase integration afterward to see if I was “close enough”. To this end, I was prepared to throw a lot of components at the situation if needed. I immediately started working with 3rd order electrical topologies with zobels looking for that perfect roll-off, thinking that with more components, I would have more control over the curve. 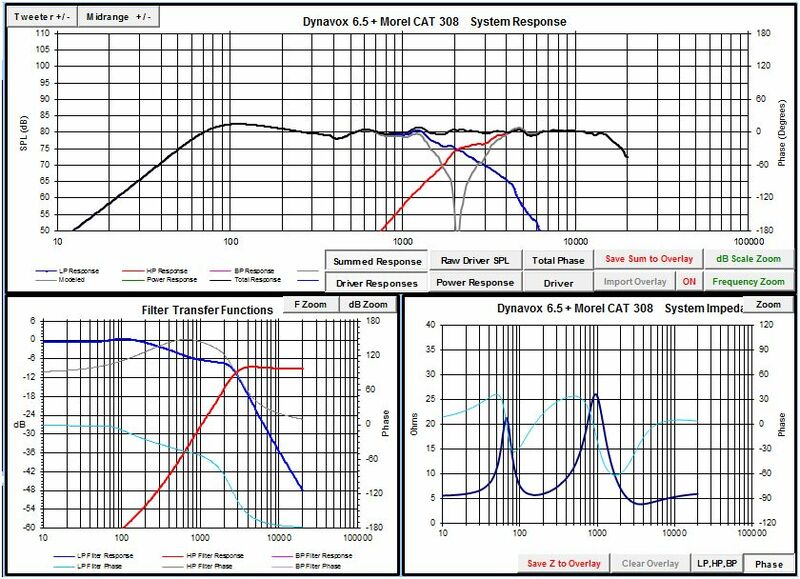 As it turned out, the drivers were so well behaved to begin with, that the smoothest curves were obtained on both drivers with a simple 2nd order filter on each. 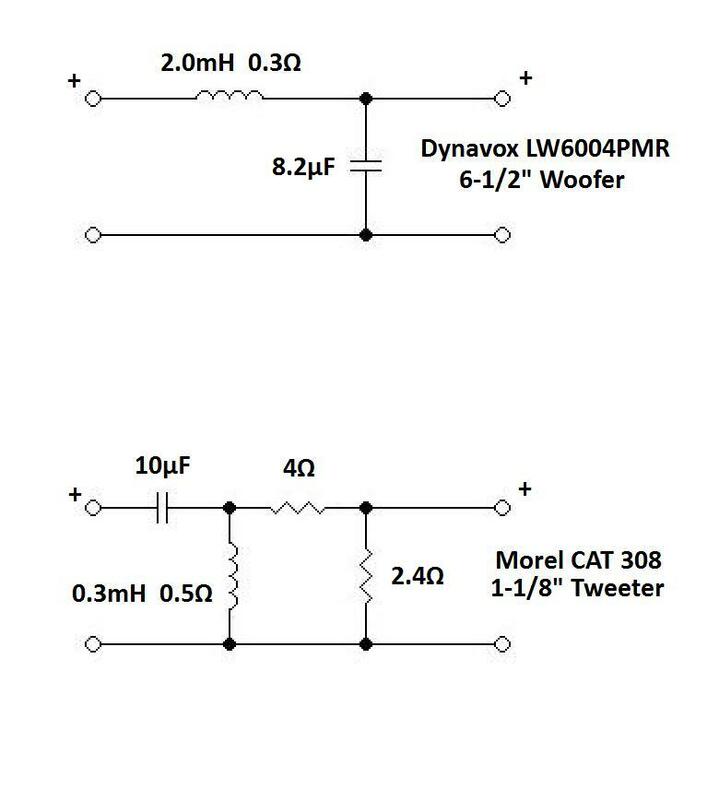 A 2-resistor L-pad was added to the tweeter circuit to bring the levels in line, but a simple cap and coil on each provided the best roll-off. I have included a zoomed out FR graph to see just how smooth the roll-offs are. I used parts I already had on hand, which are decent quality, and the parts I recommended below are decent quality as well, but having a parts count this low opens the door for using really high quality components without blowing your budget. In the crossover schematic, I have assigned a resistance value to each of the inductors. This is the value of the inductors I used, but the design is not sensitive to these values so using better inductors should only make it sound better. With only 6 components per side, this may be a good design to experiment with boutique caps and coils. Not many tips to offer here. The drivers are straightforward and the crossover simple. 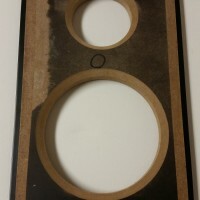 I did chamfer the backs of the woofer hole for improved airflow and the tweeter hole for easier access to the terminals. I’ll just come right out and say it. I love these speakers. 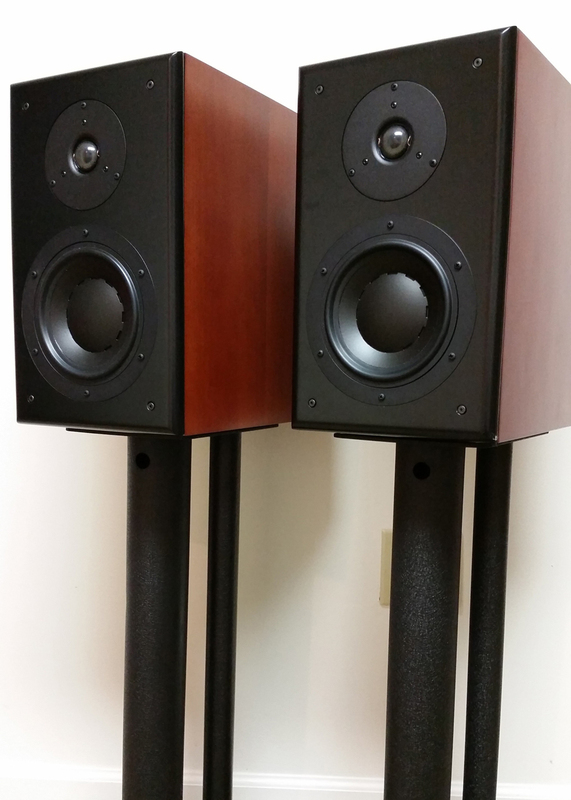 They are the most neutral speakers I have ever built, without being the least bit lifeless. 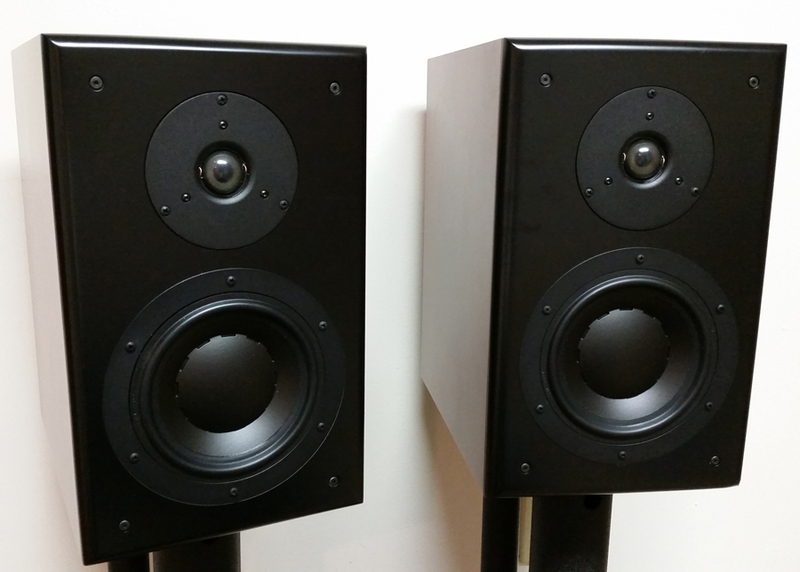 They are the most satisfying at low volumes of any speaker I have built. 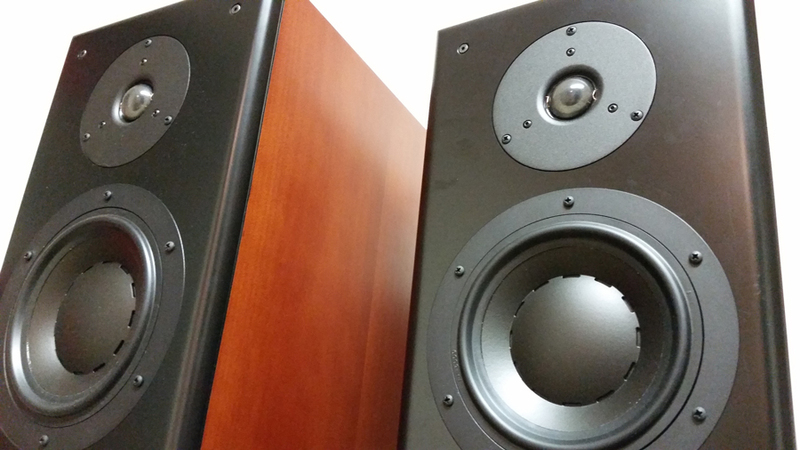 They aren’t the last word in output or bass extension (although a subwoofer would solve both of those problems), but I find myself attracted to my entire music collection again as EVERYTHING sounds great on these – not just the well recorded stuff. So with this in mind, and circling back to the goals, I’m actually not sure which is the stronger contributor to this listening experience. 1) I wanted to try the drivers. I tried the drivers. I love the drivers. They’re both very well made, very easy to work with in all regards, and produced an end result that I couldn’t be happier with. 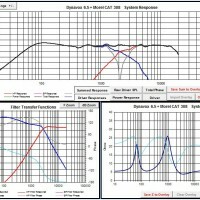 I’m going to say that the tweeter is the best tweeter that I’ve worked with personally (grain of salt: it’s also among the most expensive that I’ve worked with personally – I’ve never worked with $100+ tweeters), and besides the high Qts, there’s just nothing to complain about in the woofer. It has a beautiful neutral midrange and dynamic bass despite its minimal Xmax. It’s a beautifully made driver as well – kind of a shame to hide its backside in the enclosure. 2) I wanted to prioritize roll-off smoothness over phase integration. I did so. The phase integration was still decent, as can be implied from the reverse null overlaid in the FR graph, but the driver phases did not track for very far on either side of the xo point as I usually try for, nor did this tracking maintain itself well as you move from the design axis. I could have easily improved both of these areas, but doing so resulted in more peaks or a sharper knee in the roll-off so I opted for smoothness as intended. 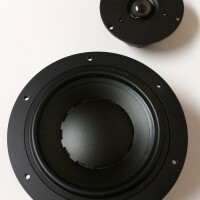 As stated earlier, this speaker is incredibly neutral with few enough offenses that I think I can chalk them up to poor recordings or mixes when they do occur. I don’t know if I can ascribe this to the smoothness-over-phase choice, but I know I will continue to make this choice on future builds until the data tells me to go the other way. I have a feeling it won’t. I am a member of the Speaker Building Design Team. Congrats on a killer build Dan!! awesome build! Any thoughts or plans to build an MTM version of this? Hi there! 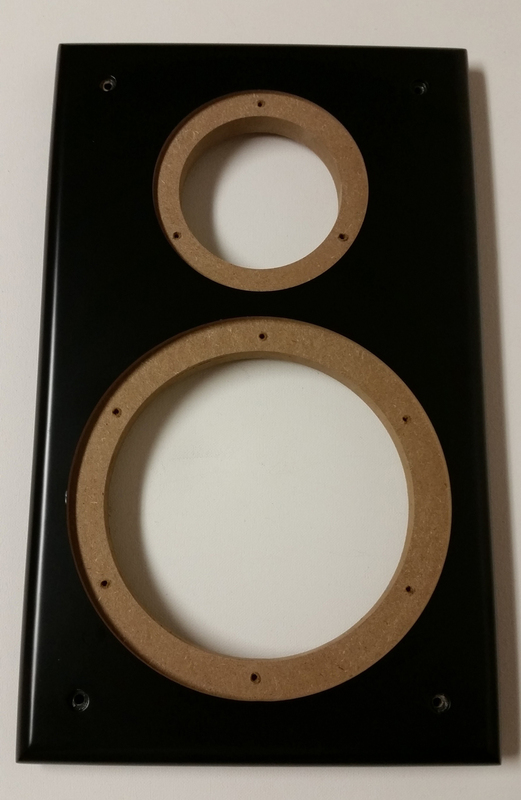 I am a woodworker and think these would be a perfect first speaker build for personal use. 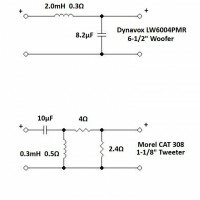 I have Sonos throughout the house, and would like to know if you think the 55watts RMS provided by the Sonos Play Amp would be sufficient to drive these speakers. Does not need to fill a large space. 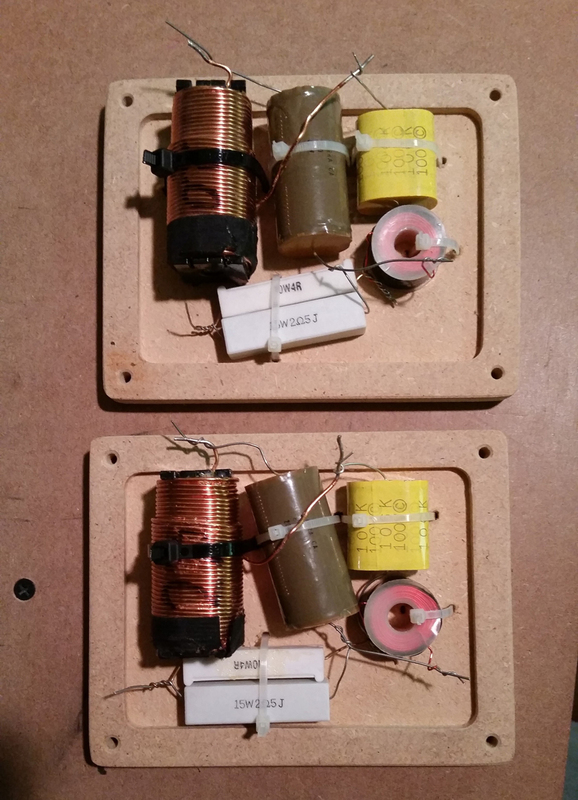 55 watts RMS will be plenty to drive these. I sometimes use a 20 watt/ch chip amp to drive them to satisfying levels in a smallish space. Awesome. Thank you for the reply! Dan, these sound awesome. I am going to try and replicate what you have here and was wondering if the dimensions you give are for the internal space or for total space including MDF boards? Thanks! Thanks Casey! The internal air space itself is about a half a cubic foot, but the design is not super sensitive to this volume. You could go about 20% smaller or probably 50% larger without changing the outcome too much. You’ll just get a little less bass extension the smaller you go. Good luck and please let me know what you think when they’re done! Nice Build Dan. I would love to make a set of these and have a few questions. The confusing part to me is the crossover. Some of the items on your parts list are not matching the photo of the crossover. 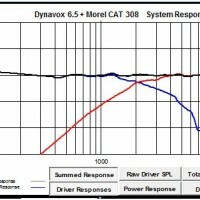 Lets say that I wanted to use the Dynovox soft dome tweeter instead of the Moral. Would that comletely change the parts used in the crossover? Also, it looks like the volume of the box is not that important in this build so could I use a curved box with about .3 more volume? Thanks for any help. The parts in the parts list are the correct components for this build. 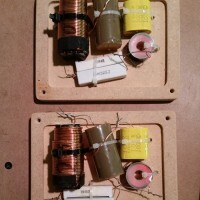 My prototype crossover used slightly different components, but nothing that would affect the sonic qualities of the speaker. 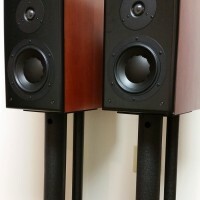 I would not replace the Morel tweeter with any other tweeter as this design is very well balanced as is. 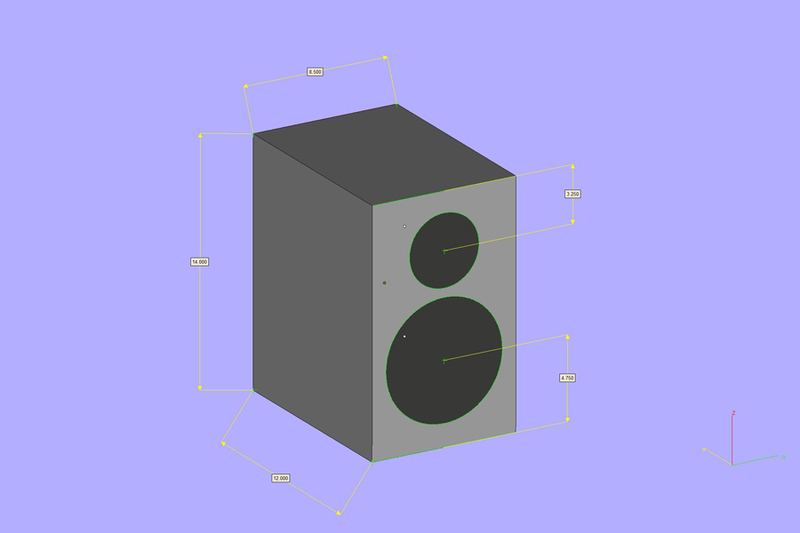 A larger box will be no problem at all, but I would try to keep the front baffle close to the original width with the drivers mounted similarly with respect to the top of the baffle. Hope this helps. Really nice build. 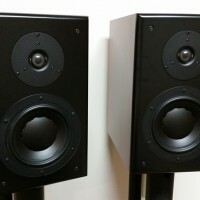 Looking at these woofers for a bookshelf or compact MLTL project and your writeup has inspired me!